Extract from the Foreword by Jim Crumley '...There is a certain gentle charm at work in these pages. The participatory relationship with nature is compassionate rather than confrontational. ...Its simplicity says more than it appears to say. Sip it slowly, the way you might sip glacial meltwater from your hand'. Bears in the kitchen, rattlesnakes at the door - is this any way for a woman in today's western world to live? In the author's view, emphatically yes! Loren Cruden states her case in humorous and haunting stories of living up close and personal with Nature, in essays about the vital relationship between human culture and its natural context and in poems reminding us that beauty is participatory. 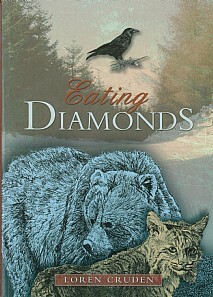 Instead of the weekender's exploits or the scientists' findings, Eating Diamonds offers the rich experiences of someone who for twenty-five years lived intimately within North American and Scottish landscapes. Her portrayal of the wealth to be found in the simplest of human situations, without electricity, or 'phone - conveniences taken for granted as desirable - asks modern people to look again at what makes life good and the future bright. Complemented with superb wildlife drawings and photographs. Anyone with an interest in nature writing, poetry or the natural world will be sure to enjoy the words and pictures of this fascinating, humorous and delightful book.